Bootstrapped startup Print.io has been quietly serving as the print supplier for a number of larger companies for a year now, including Fast Labs Inc. (now rebranded “Twenty20”), and others. But today the company is breaking out on its own with a new consumer-facing application called Hellopics, which will serve as both a testbed and demo for what Print.io has to offer in terms of print-on-demand products. 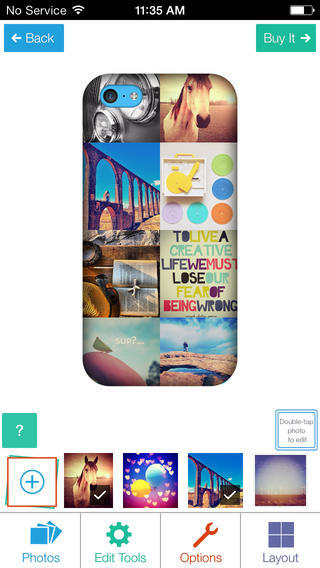 The app allows users to order custom printed items, like iPhone and iPad cases, canvas wraps, posters, photo books, coffee mugs, and much more, all emblazoned with your own photos from the iPhone Camera Roll, Facebook, Instagram, Dropbox, Picasa, or Flickr. At launch, there are around five products live, and several more listed as “coming soon.” In time, the company will scale the service up to over 100 different product lines and thousands of SKU’s. According to Print.io founder Austen Bernstein, the plan is to launch five to ten more products each week leading up to the holidays, all of which can be shipped worldwide. Bernstein, who says he’s always had an interest in art and photography as well as having an entrepreneurial spirit, founded Print.io after previously working in growth stage capital at Tiger Global Management, and Insight Venture Partners in New York. With Print.io, his goal has been to build the largest international print network, and then offer that as a service to developers who could then integrate the print-on-demand option in their own applications as a tool to help them monetize. To date, Print.io has shipped to over 40,000 customers in 110 countries, says Bernstein. “We realized very early on that we’d prefer to go the Aviary model, where they had…a lot less friction to get to where they now have almost 5,000 partners. And that’s the kind of partner base we’re looking to have,” he says, referencing Aviary’s photo editing toolkit, which developers can integrate in their apps. Today, Print.io has a “fairly comprehensive beta list of partners,” says Bernstein, but he isn’t allowed to disclose many by name, due to agreements with those businesses. However, he says that the company has shipped over $1 million in revenue during Print.io’s first year, and following last week’s soft launch of the consumer-facing Hellopics service on iOS and Android, they’ve sold over $1,000 worth of product from only a few thousand registered users. The company is now aiming to make Hellopics something of a Shutterfly alternative, competing both on price and with a broader selection of products, too. Most photo printing apps today are limited, states the founder – one will offer photo prints, another a mosaic, another a photo book, and so on. “The full breadth of photo commerce should be in one app,” Bernstein says. With Hellopics, the plan is to offer a lot more items than you would usually find in photo printing or photo gift apps, including things like t-shirts, flip-flops, fleece blankets, show curtains, pillows, sticker books, and more, in addition to the more traditional photo products like prints, calendars, canvases, and books. 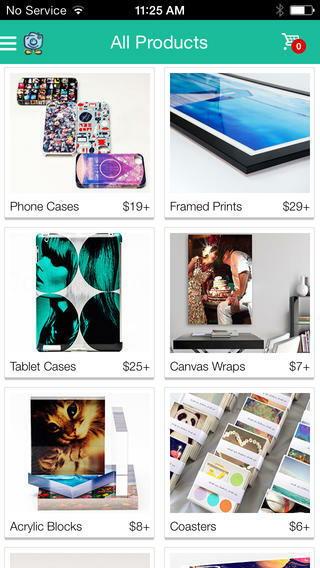 Print.io/Hellopics (both are a part of the Breakout Commerce platform) is a 15-person startup, co-founded by Bernstein and CTO Micah Smith. The company is technically based out of New York, but its team operates remotely. The company has not yet raised outside funding, but may consider raising growth capital in the near future. In addition to Twenty20, Print.io works with art retailer JuicyCanvas (http://juicycanvas.com), e-commerce site Sole Bicycles (http://www.solebicycles.com/), and artist Andrew Saul Visuals (http://www.andrewsaulvisuals.com).